Be the first to share your favorite memory, photo or story of Bradley. This memorial page is dedicated for family, friends and future generations to celebrate the life of their loved one. Bradley J. Felt of Bloomfield Hills, died October 6, 2011, at St. Joseph Mercy Hospital in Pontiac. He was 55 years old. Bradley was born May 6, 1956, in Royal Oak, to Jeanne (nee Vorhes) and Charles H. Felt. He graduated from Andover High School in Bloomfield Hills in 1974 and attended Oakland University. Bradley was a deep thinker who was passionate about music and the arts. 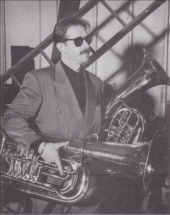 He played the euphonium and tuba. He also enjoyed the beauty of the outdoors. Bradley was deeply loved and will be sorely missed by many. Bradley is survived by his brother, Douglas Felt and many friends outside and within the arts community. He is preceded in death by his parents, Charles and Jeanne Felt and sister, Carole Felt. A Memorial Service will be held at Lynch & Sons Funeral Home, 1368 N. Crooks Road (between 14-15 Mile Rds.) Saturday, October 15th at 2pm. Friends may visit Friday, October 14th, 4-8pm. Memorials appreciated to the American Cancer Society, 20450 Civic Center Drive, Southfield, Michigan 48076. "Email Address" would like to share the life celebration of Bradley J. Felt. Click on the "link" to go to share a favorite memory or leave a condolence message for the family.